In addition to this, Avenza has just launched its PDF Maps Affiliate Program for any retailer or business, including both online and physical stores, blogs, portals and information sites. This program makes it possible for retailers and businesses to now earn revenue by promoting and selling digital maps directly to its customers using affiliate links on websites or by using signage with QR codes. Each map sale conducted in this manner will earn the affiliate a share of the revenue. Florence also points out that big companies like Blockbuster, Kodak, and Tower Records are going out of business because of technology advances. Companies like National Geographic, Rand McNally, or Westprint, who have provided traditional paper maps historically, are now challenged by Apple, Google, TomTom, or Garmin. People may say they don’t need the PDF Maps app because they have Google Maps on their phones already. But if you are in a national park or somewhere that doesn’t have bandwidth, the phone GPS is not going to work. A PDF map downloaded before you get out of range is going to be a real plus. Secondly, Google Maps does not provide bathymetric maps or maps of ski trails in a given area. It is not that good for very specific map information as PDF Maps are. Thirdly, if you are traveling to Europe, Asia or South America, roaming charges can get very expensive if you use your Google Maps or other online search while traveling. It makes sense to download a PDF Map at a hotel or Starbucks where you have connectivity, so that you can use the map to navigate outside the data roaming. Avenza has publishers from all over the world, including National Geographic, branches of the U.S. Government such as the U.S. Forest Service and USGS interested in the Affiliate Program. Another common scenario: you buy an airline ticket from Expedia, then the airline asks do you want to rent a car, hotel, theatre tickets, tours, etc. In addition, they can sell customers a map delivered directly to their phone. There are many ways in which the Affiiliate Program can be useful to publishers and vendors. In Washington D.C. alone, at a Hilton Hotel, for example, thousands of hours a month are spent interacting with guests to give them a free paper map and directions. If there was a QR scan code at the hotel for PDF Maps, guests could get a map delivered to their phones and not take up as much time at the information desk. Rather than alienating the brick-and- mortar businesses such as Borders, etc.. Avenza wants to enable retailers to participate in the digital economy of the map business. Avenza envisions having digital maps available in such places as airports, REI, Cabelas and other places where people would most likely be interested in acquiring maps. Clearly PDF Maps is a way to go in the “real world app” category that will appeal to all those young digital natives out there. From company materials: Retailers and businesses interested in joining the affiliate program can sign up for free and can get in contact with the PDF Maps team at http://www.pdf-maps.com/affiliates. The PDF Maps app is available now on the iTunes App Store and Google Play Store free of charge for personal recreational use. A Windows version is currently in public beta release. Commercial, government and academic use licensing is available for a nominal annual fee. 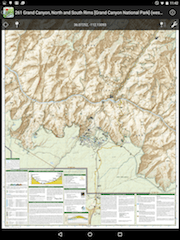 For more information about PDF Maps, visit http://www.pdf-maps.com or visit Avenza Systems at http://www.avenza.com. 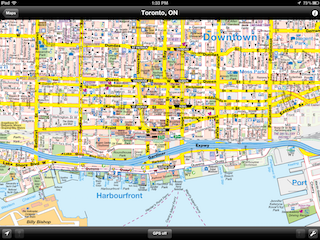 Pricing of each map is set by the publisher and free maps remain free to users through the PDF Maps in-app store. Commercial use licensing starts at US$49 per year and drops on a per-device basis as deployment numbers increase. This entry was posted on Friday, January 15th, 2016 at 10:35 am. You can follow any responses to this entry through the RSS 2.0 feed. You can leave a response, or trackback from your own site.